Welcome to the Tuesday Tutorials & Tips party where any tutorial, room reveal, DIY project, craft, recipe, and tip is welcome! This party’s focus is on inspiring others through step by step tutorials and tips. If you have something to share that fits into that humungous category, then I hope you’ll link up! I will feature the best of the best in a few posts throughout the week. This week, I have a new sponsor to introduce you to that I think you’ll enjoy! 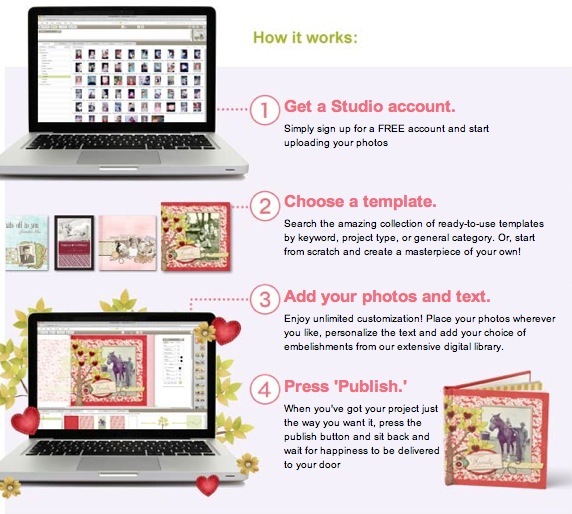 Heritage Makers is an online, digital scrapbooking/publishing company, where you can simply upload your photos onto their secure site, drag & drop them into any of the 7,000 pre-designed templates or even use your own creativity and design a project from scratch. When you’re done, you simply publish your project and Heritage Makers does all the work! Your finished masterpiece will be delivered to your front door in a matter of days. You have endless project possibilities! Look at the photo below to see some of the ways you can record your family’s heritage for generations to come! I am great at taking photos, but horrible at printing them out. As many of you know my hard drive crashed and I lost all of my photos. Sob! This is such an easy and attractive way to make sure you are saving your family’s history off of your hard drive! Please read the rules and link up and link back! Thanks for hosting. So may great blogs, hints and tips…so little time! This is so awesome! I would make this scrapbook for my granddaughter, Dakota, who lost her older sister last year. I think it would be a wonderful keepsake. I would create a book for my grandson who is learning to read! Thanks for the giveaway! I am not familiar with this digital album company and it’s always nice to learn about some options for my books! I would make one for my cousin’s wife who just married into the family as a welcome and we love and want you in the family gift! I would make the book for my 3 girls, they’d love it! Thanks so much for hosting! Soo many great links, lovin’ them! I would totally do up a photo book for my Grandmother. I think she’d love it! Thanks Beth for hosting and for the giveaway. If I were to win this I would create this photobook for my children; the loves of my life! Thanks, Beth for the amazing giveaway and hosting for us once again. I am always amazed at the creativity people have! Love it! I would love to win this! My oldest grandson is graduating this spring and this would make a wonderful gift for him. Thank you for hosting! Always so many wonderful ideas and projects to see! Love love love photo books. Thanks for the giveaway! Would definitely make a book of my kids, for my parents, who are so far away in India. What a great giveaway … Thank you!!! I would make this photo book for my sweet daughter! Precious memories. Thank you for hosting this party today! I make a photobook every summer to document the 2 weeks we spend at our lakehouse, then leave the books at the cabin. It’s so fun to look back at our previous summers when we are there! Thank you so much for hosting this party, Beth! I started a new linky party last week, and I have new respect for people who host big parties. It’s a LOT of work! I made a simple Easter wall hanging, so I’m sharing that tutorial. I can hardly believe that Easter is less than two weeks away–it’s about time I got things decorated around here! Thanks so much for hosting and the giveaway! Holy Smokes I am late to the party! Was in bed early last night for some much needed sleep! I’ll be back later to enter the giveaway, gotta go do the school run 🙂 Thanks for hosting the party! Just linked up my mantel! Thanks for hosting! Each week I am inspired! Another very nice party! Thanks for hosting! I would create it for all the old pictures of my family. Thank you so much for hosting Beth! I hope you have a wonderful Tuesday. Thanks for taking the time to host this great link party each week, Beth! And, as far as the giveaway, I’d probably make a book for my son’s graduation. How fun are those photo books?!? Also, thanks for hosting! I look forward to this party every week! I’d create it for my family. Thank you so much for hosting. Great party & giveaway! thanks for the party, chica! i would make a photobook for my 3 year old’s birthday. i made one for my other daughter when she was 3 with the “I Love You Through and Through” story in it, with pictures of her telling the story. it’s a favorite book at our house! Thanks so much for having us over, Beth! I hope your week is off to a great start! For some reason I can’t get my photo to show up! The chair makeover with CeCe Caldwells Chalk paint one. And now it is on there twice!! Sorry! thanks for hosting us all. Thank you for hosting, Beth! 🙂 I met one of the Heritage Makers girls at the MOPS Convention a few years ago, and they have some great products!